Over 80% sold out. CUSTOM CRAFTED IN THE HEART OF DAVIS SQ. The FINAL RELEASE OF THESE LUXURY RESIDENCES. This 2 BDRM/1 BATH features an expansive living space! Consider yourself home with the warmth of wide plank engineered hard oak floors and crown moldings. 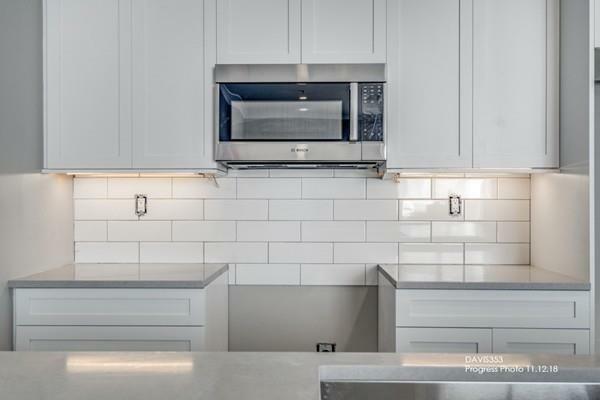 Custom Crafted Luxury Kitchen with upgraded Thermado Stainless Appliances, Subway Tile Backsplash and Quartz Counter Breakfast Bar. LARGE double basin master bath. Includes ELEVATOR AND GARAGE PARKING. Leave the car at home and CRUSH YOUR COMMUTE! Red Line=.3 miles. Walker's Paradise Walk Score of 96. INCLUDES 1 Year MBTA PASS and 1 Yr Sports Club Membership. DAVIS SQUARE IS EXQUISITELY HIP. Everything at your doorstep: restaurants, bars, farmer's market, Parks, Museum of Bad Art, Somerville Theatre, Rockwell, Live Music + Festivals. YOU BELONG IN YOUR ELEMENT!